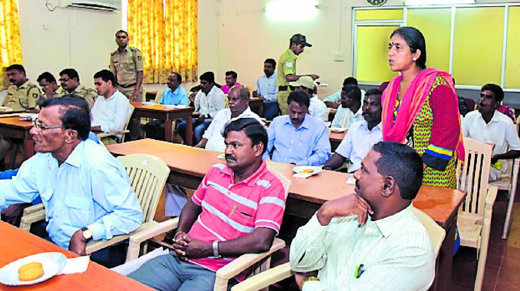 Mangaluru, Nov 20, 2018: The issue of sand extraction rocked the SC/ST grievances meeting conducted by the Dakshina Kannada superintendent of police on Nov 19, Monday. Superintendent Dr B R Ravikanthe Gowda, who responded to the complaints, said that the issue would be discussed in the next co-ordination committee meeting and measures would be taken to ensure that justice is delivered to members of the SC community. SC leader Shekar expressed displeasure over the non-availability of sand posing a hindrance to the construction of houses by the poor. The SP said that the district administration had taken steps to solve the row over sand. The sand for the construction of Ashraya houses will be supplied through PWD, he promised. Raising the issue of salary paid to teachers in private schools, Community leader Balakrishna said in spite of fixing minimum wages of Rs 17,500 a month, the teachers get a meagre salary by deducting about Rs 10,000 a month. As a result, teachers hailing from the SC community face injustice. Reacting to it, the superintendent promised to get it verified through the local police and submit a report to the Directorate of Enforcement of Civil Rights. Leader Anand said all the students who come to city from rural areas for higher education should get hostel facilities. Thousands of students submit applications for seeking financial assistance from Ambedkar Development Corporation. All those who have applied should get the assistance from the government. The SP said that all the SC/ST atrocity cases are considered seriously by the police. Many a time due to lack of witnesses, the case get acquitted in the court. The Police Department will organise public contact programme at police stations to infuse confidence among the witnesses, he said.